Picture from group : Schisty rock on the summit of Djouce. 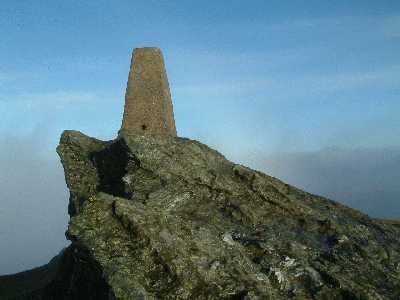 Picture: Schisty rock on the summit of Djouce. Extremely busy summit, easily accessible with good views. Djouce is fairly near Dublin and has good access from many sides. Its extensive views include much of north east Wicklow, the Irish Sea and nearer places such as the Great Sugar Loaf. 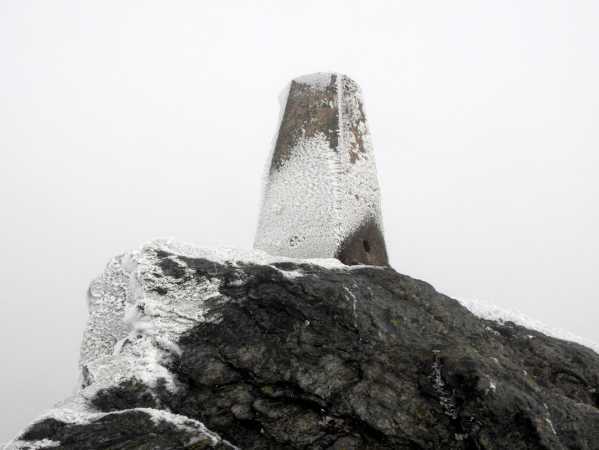 Because of its attractions it is in 2015 the fourth most logged summit on MountainViews (after Carrauntoohil, Lugnaquillia and Slieve Donard). The quickest way up is from the R759 to its SW where there are several car parks such as one at O1632 0845 A. This will take around 90 minutes. Track 2113. From the Old Coach Road (L1036) on Long Hill to the east there are also various places to start such as O1932 0774 B which would take around 2.5 hours. Perhaps the most popular and interesting route is from the north starting at Crone Wood Car Park O1926 1418 C. A route including War Hill would take around 4 hours. Track 943. The OSI map indicates the presence of a cairn on Djouce, slightly north of the trig pillar, but any trace of it would seem to have been obliterated. 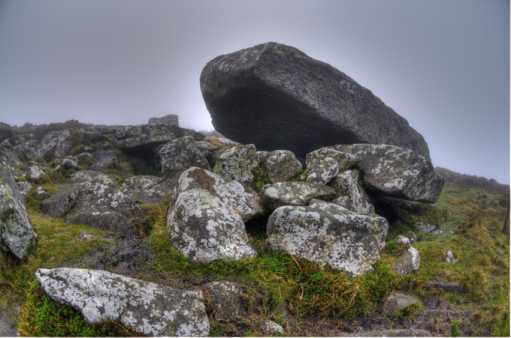 Since the Irish word ‘dioghais’, from which Djouce is derived, is usually taken to mean a fortified height, perhaps it might not be implausible to see in that a reference to the old cairn that once stood on top. More interesting today is the so-called ‘Coffin Stone’ on the lower NW flank of the mountain (O 1719 1050 D). In the OSI map (and also in the Harvey map of Wicklow), for some unknown reason this feature is indicated as a Standing Stone, but any source I have consulted speaks of a Portal Tomb at this point. The enormous coffin-like slab is a capstone that would have rested on two tall stones or portals at one end, forming an entrance, and would have sloped down to a back stone, providing support at the other. The chamber formed in this way would then have been walled in with side slabs compacted with big stones and might or might not have been enclosed in a cairn. Today the portals appear to have fallen outwards, but perhaps they were not very high to begin with. What strikes me as unusual about this tomb is that it is almost hidden away among the hills, whereas so many of the megalithic monuments we are familiar with in Dublin and Wicklow are well within view of the fertile plains or valleys where the people would probably have lived. A boggy track leads from the top of Djouce down to the Coffin Stone and on to War Hill, but its start can be difficult to find in mist and fog. Here and there, the rusty iron posts of an old deer fence serve as a handrail, too, when you can see them. Climbing last Sunday on Djouce, came across a couple of young "mountain bikers". It is hard to put your nose up to young fellows getting out into the air, escaping from their Playstations. I was tut-tuting at the environmental damage they were doing, as I tried to keep myself between the track guides, to prevent erosion, when suddenly I was confronted by 3 motorcylists scrambling between Djouce and War Hill. To make it worse, there is a dedicated scrambling track on the other side of the road. Remembering Mark Twain's famous comment that you should never underestimate the power of ignorant people in large numbers, I kept to myself I'm afraid! I don't know if anyone patrols these areas for the National Park or Coilte - I suppose not. Its all a pity. I travelled on, and had a marvellous walk regardless. Saturday 22 Dec 2002 desperate to get a walk in before Christmas took over I approached Djouce from the boardwalk on the southern side, parking in the car park above the Pier Gates.